Recently my father had his 70th birthday. I thought about a suiting present and came up with a paper notebook. 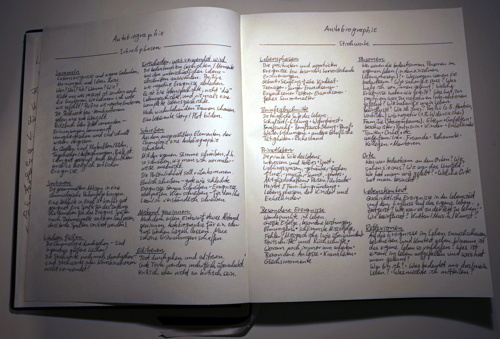 Not that creative, not even bound myself, except … on the first two pages are some hints on how to write an autobiography. I thought that there are some interesting memories and perspectives within 70 years of life. And I thought it was a nice gesture to ask him to write it down. Pages with hints — translated (and readable) text below. (There’s a reason why I usually write on a keyboard. Interesting or relevant events during your life and your own thoughts and opinions about them. Not only what happened, but also the related emotions. How did you feel? Positive and negative emotions. Look at the Memory Triggers for an overview. Use a notepad — memories frequently come as quickly as they are forgotten. Use photo albums, pictures, diaries, notes, letters, etc. for stimulation. Visit news archives to remind yourself of the things that did happen. Put all notes into a chronological order. Excel can be used for this purpose. One column for the date, the next one for the event. Sort by date but take care that the event column is sorted as well. Look for gaps in time. Check the Memory Triggers — did you use all relevant memory triggers/combination of Memory Triggers? Decide what you want to use. Take the most meaningful stories/moments from the different phases of your life. Cover positive and negative events. Remember that you write one life history, not *the* life history, and never the complete life history. Look for reoccurring themes. Create a coherent story/plot. Use the selected elements of your chronology to write an autobiography. Write in your own voice — like you normally talk to others. Your personality should be visible in your writing. Write honestly — good and bad moments. Write accurately — check the dates/events. Write clearly — the reader must understand you. After writing the first draft, get some distance. Put the autobiography down for one or two weeks. Create new beautiful memories. Reread and edit the text. Editing is a normal part of writing. Good writing is re-writing. Be critical — but not too critical. Most positive/negative events and salient memories. Occupational side of your life. Private side of your life. Who were the influential people in your own life (in the different life phases)? Why were they influential? How did they look like? What did you learn from them? Which experiences did you share with them? What lead to positive or negative interactions? How did they influence your life? Positive (e.g., mentors, role models) and negative (opponents)? Family (Family tree): Parents, Grandparents, Siblings, Partner, Children, Grandchildren, Aunts, Uncles, etc. Outside of the family: Friends, Acquaintances, Colleagues, Mentors/Coaches, etc. What were the meaningful places? How did they look like? How was the city? Where did you live how? Which places did you visit? Historical events in your life-time and the influence it has on your own life. Zeitgeist? How was it to be living during that time? What did influence you how? Culture? Music? Art? Looking back at the events in your life, describe them and give them context. Why did your life turn out this way? What did you notice in your life, what did you learn? Who are you? What does life, your life mean to you? What do you want to convey? Greatest successes, best performances, honors, etc., Worst Failures, mistakes, errors, and how to got past them (and on which you still work), Advances and setbacks, Illnesses, etc. But yup, have fun, and create happy memories.